Who are the Merchants of Death and Moral Cowards who Voted for the Euthanasia Laws in Victoria? As of yesterday, the Victoria State Parliament became the first state in Australia to pass laws that make euthanasia legal. The laws still have to be confirmed by an upper house vote but at this stage, it appears to a mere formality. 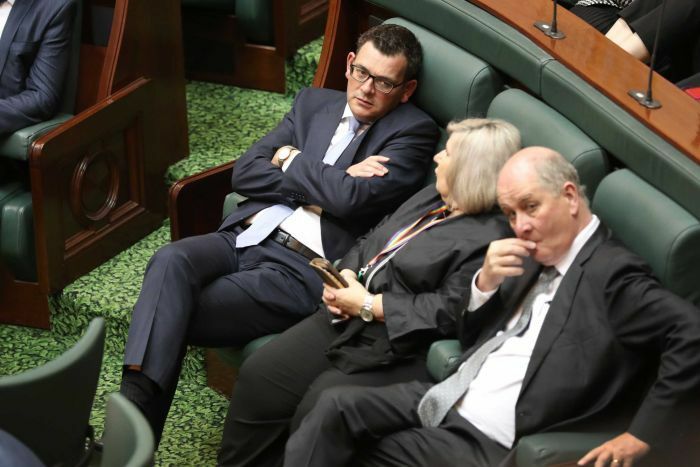 The political underhandedness and trickery to get the laws through the parliament have been a culmination of sheer arrogance that is becoming the signature of the Dan Andrews Labor Government. In every way, Dan Andrews is symbolic of Socialist ideology being implement regardless of what the people of Victoria want. He pushes, finances and regulates into things like the sexually perverted ‘Safe Schools’ program that forces young children to learn explicit gender fluid theory; he was a lead actor in creating the 2008 laws that force pro-life doctors to refer women to abortions against the conscience and now he is at the centre of creating the laws that legalize Euthanasia. There is nothing new about activists pushing for euthanasia to be legalized in Australia. Dr (Death) Philip Nitschke has spent years trying to introduce his suicide machines into Australia. However every attempt to do so in the past has, with good reason, been either voted down or in the of the Northern Territory overruled by the federal government. Most attempts to pass euthanasia laws were destined to fail due to a lack of support from the public and the ad-hoc way that they were formally introduced as grandstanding private member’s bills. The reason for such caution is obvious. When dealing with the matter of death and killing of patients, the laws passed in one state have national implications and a very high likely hood of a creating euthanasia tourist industry. The way that Dan Andrews approached changing the law was far more organized and strategic. He took the issue away from the public discourse and handed it over to a committee that worked out how to get the critical numbers of parliamentarians to pass the law. Key to his strategy was a highly biased and flawed report released months ago that laid out the framework of how to manage the politicians. If you think that I am kidding about the report then you need only read it. The report was so biased in favor of legalizing euthanasia that all objections were sneeringly dismissed as ‘Diety Based’ and therefore illegitimate. Any other rational objections were never tabled, investigated or even discussed in the report, as it smeared anti-euthanasia views as being nothing but superstitions. The report also tried to regurgitate the same so-called safeguards that euthanasia activists have been trotting out for decades: Multiple doctors signing off, patient consent, no coercion clauses, no financial incentive etc… There was no safeguard in the report that we had not seen before. The only new information in the report was how to manage pressure and herd the objections of the politicians through the parliament. This was a political strategy report, not an open inquiry into the impact of legalizing euthanasia. The recommendation to legalize euthanasia was already predefined long before the evidence was cherry-picked as proof. The tone of the report focused on the cowardice and fear of politicians when it comes to highly controversial social issues. Most of the report and the preparation for passing the laws was spent counting enough heads to get it through. The debate in the Parliament was farce once the numbers to pass the laws were secured. Over 140 amendments and further safeguards were suggested in the debate but Dan Andrews would have none of it. He knew that he had the numbers to pass the law as it stood and he was willing to let the debate run for over 24 hours until the vote was held. Then arrogance and bloody-mindedness of the man knows no limits. There was no change, no amendment, not even the slightest recognition that he could possibly be wrong. Once Dan Andrews had the numbers and he was going ahead. The final tally after the marathon session was in favor by just ten votes. In a parliament that is dominated by left-wing parties, this reflects a current political reality. That political reality is so far left of center, so authoritarian in its approach, so contemptuous of mainstream views that Dan Andrew looks more like a commissar than a Premier for all Victorians. The next phase of this process is to send the law to the upper house of parliament where it will be debated and put another vote. If the law cannot be stopped there then Victoria will be the first state to legalize state sanction killing of the sick and fragile of spirit.